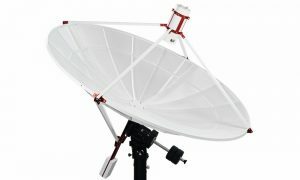 PrimaLuceLab offers a unique opportunity to enjoy the cosmos and beyond with the SPIDER230c, a radio telescope that combines radio technologies with that of amateur astronomy, packaged in a powerful, modular and easy-to-use system. The SPIDER230c amateur radio telescope uses a WEB230-5 antenna – a mesh 2.3-meter diameter parabolic antenna designed to offer a large diameter with the lowest possible weight. The reflecting surface of this antenna (the primary reflector) is composed of an aluminum mesh with 2×2-mm squared holes for optimum reflectivity of radio waves with frequencies up to 12 GHz. Mesh material is positioned and installed by hand by PrimaLuceLab technicians in order to obtain a parabolic surface that is as accurate as possible (within the limits of the mechanical support). The result is a superior quality mesh-parabolic antenna that offers a higher gain and a more precise parabolic shape. The SPIDER230c amateur radio telescope is designed to be used with computerized equatorial mounts. PrimaLuceLab supplies an N-EQ8 SynScan mount, but the SPIDER230c can be installed on any equatorial mount with at least a 55-kilogram load capacity and Losmandy-type dovetail. For the correct operation of the radio telescope, the equatorial mount is not installed on the tripod (which often does not have sufficient rigidity) but on a separate pier, which is provided with the SPIDER230c. The EQ8 mount (or other computerized mounts, if you want to order the SPIDER 230c without mount) are controlled by the company’s RadioUniversePRO software through the ASCOM platform so if you want to use your own mount, make sure that it has an ASCOM driver. Thanks to two counterweights sliding system with protection against accidental drops, users can get perfect balance even in declination axis for maximum tracking and automatic go-to performances of the mount. Without counterweights, the radio telescope would be completely biased towards the front (because of the weight of the primary reflector and LNA + illuminator group with support rods) and therefore could not properly point and track objects in the sky. A special system of rear tie rods increases the rigidity of the structure while minimizing the deformation of such a big diameter parabolic antenna. 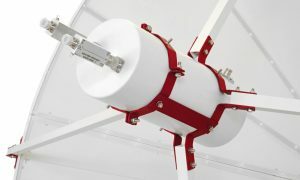 Developed specifically for 1.42 GHz PrimaLuceLab radio telescopes, an H-FEED feed horn is designed for optimal illumination of the primary reflector allowing high gain and minimize side lobes and the spillover effect, thus obtaining the best possible performance from the 2.3 meters parabolic antenna. The feed horn is designed to allow the reception of dual polarization with support for two professional Low Noise Amplifiers (LNA) for the 1.42 GHz frequency. The feed horn is positioned in the perfect point of focus of the antenna through a rigid support with 4 supports, in order to have low obstruction and with a focusing device to precisely focus and maximize the performance of the entire radio telescope. In order to get the best possible performance with the antenna of the SPIDER 230C, the H142-One receiver offers a 1.42 GHz superheterodyne type radiometer/spectrometer, double conversion (type UP/DOWN) with 50 MHz received instantaneous bandwidth (RF=1.395MHz-1.445MHz) and 14-bit analog to digital converter. The H142-One receiver has spectrometer with 1024 channels (each 61 KHz) that are displayed and processed in real time by the control software supplied with the radio telescope. Thanks to the high gain and the low electronic noise of this receiver, the SPIDER 230C radio telescope is able to record many radio sources in the Universe. The included RadioUniversePRO software provides the ability to control the antenna position and acquisition parameters of the receiver. This way, you can not only record radiometric data coming from the sky, but also transit images of radio sources you want to study. A window shows the entire sky with the position of the main radio sources with respect to stars and constellations. The software is specifically designed to allow you to check all the parameters, operation and record various results with the radio telescope. RadioUniversePRO can be installed on a standard Windows computer and is compatible with Windows 7, Windows 8 and Windows 10. 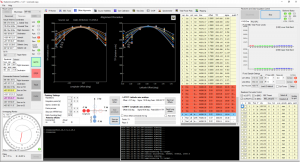 The graphical interface provides a simple mode with integrated planetarium that shows, in real time, the position of radio sources in the sky, and then allows you to simply use the SPIDER 230C radio telescope. At the same time RadioUniversePRO offers the possibility to activate the advanced interface which adds many options, customizations and typical functions of professional radio telescopes and are therefore particularly useful for expert users (that found in RadioUniversePRO the same modus operandi of the large-sized radio telescopes). The complete SPIDER230c includes: (1) WEB230-5 parabolic dish with support device for equatorial mounts; (2) N-EQ8 SkyScan equatorial mount with two counterweights; (3) Mount tripod with central column; (4) H142-One receiver, radiometer/spectrometer, 1.42 GHz frequency; (4) 1.42 GHz feed-horn; (5) Two high gain and stability 1.42 GHz LNA units (6) RadioUniversePRO control and processing software; and (7) User and installation manual (English and Italian). For sales in the US visit here and outside of the US here.